Comment by Steve Dale There is something really rotten about the Nationals lately. Four Corners (4corners, fourcorners) can you please follow the stink/money trail and find out who is pulling the strings on these politicians? We have had a Royal Conmission into nuclear, I think what we really need is a Royal Commission into Nuclear lobbying and its corrupting influence on our political system. 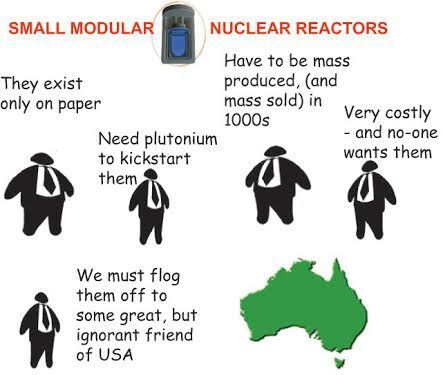 John Barilaro to push the nuclear power button The Australian, April 17, 2018 Acting NSW Premier John Bari­laro will declare nuclear power “inevitable” in a speech that slams “ignorant, 1970s” thinking for preventing development of the nation’s uranium reserves and condemning residents to blackouts. Mr Barilaro, who recently returned from an Advanced Reactor Summit in Atlanta, Georgia, spoke out in favour of nuclear power a year ago, prompting Premier Gladys Berejiklian, currently in India on a trade mission, to declare she was open-minded on the issue. “I’m in the camp of the jury’s still out,” she told the ABC then. …….The Minerals Council of Australia, a proponent of nuclear power, said the federal nuclear ban could be reversed “with a single amendment to the Environment Protection and Biodiversity Conservation Act. “The removal of four words — ‘a nuclear power plant’ — would allow nuclear industries to be considered for development in Australia,” it said.